I have begun yet another new hobby. 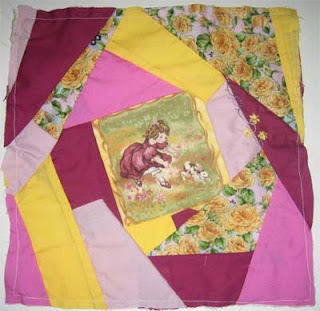 - Crazy Quilting! Thus far I have been doing mostly organizing of stash that I've purchased and stash that has been given to me. However in amongst that I have managed to begin a set of blocks. I purchased a piece of fabric which had several pictures on it and after cutting them out I had a full set of 8 different pics and another set of 6. I've begun with the 6 and have 3 of them crazy patched. 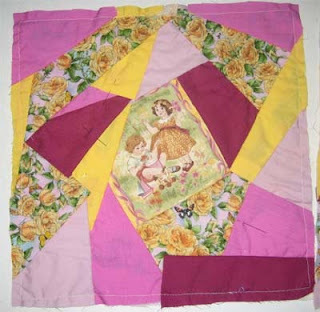 They are called naked blocks as they do not as yet have the embroidery on them. Well I did begin on one but even that's not complete as yet. 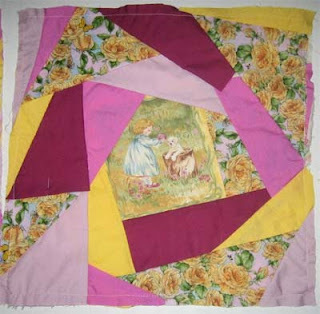 Here are the first 3 blocks to the set of 6. I hope to be able to get back to them soon and begin learning all the new stitches I've been reading up on. Those block are sooooooooo cute. Who is the luck one to get the finished project?